Using contactless RFID cards to allow secure access to buildings has become the norm. Increasingly the same access cards also being used for additional applications such as follow-me printing, cashless vending and PC log-on. While ID-cards are far more manageable and secure than traditional keys in disallowing entry when keys are lost, or employment terminated, when it comes to providing staff with access to geographically dispersed offices using the same card, the complexity and cost of the physical access control system required frequently escalates dramatically. The issues that typically arise when extending building entry management systems to cover multiple sites, or offices, stem from the stand-alone nature of common door access control solutions. These systems rely on localised, off-line, access control decision-making unsuited to scalable, centralised, management. Consider the basic parallel between IT system access controls (logging-in to a PC on a network domain) and building security access controls (using an RFID contactless card to open a door): both systems require the user to provide one or more forms of identification which can be validated against a database of users and their permissions. However, while IT-resource access controls are centralised and designed to scale across all users and sites enterprise-wide in real-time, standard door access control systems rely on dispersed decision-making which requires significant investment to periodically synchronise access-rights between the systems at each site. Adding more sites to a standard physical access control system requires the addition of dedicated synchronisation appliances, sharing data between the standalone door access systems at each location on a time-scheduled basis. As well as the cost of these appliances there is a great deal of complexity in managing the sequencing and priority of these synchronisation updates. The proprietary nature of some access control systems means it may not be possible to link the system in newly acquired premises with those used in existing sites. Where different systems can be integrated, it is likely that the data replicated between these systems first needs to be manipulated, for compatibility, before synchronisation. Increases in the number of potential door users at a site may also mean door controllers have to be up-graded to support greater capacity. Separate access control systems for the physical (door) and logical (IT) worlds can lead to security risks when updates to access permission are not made in both systems at the same time. A study of desk-based workers in the UK and US revealed that 36% were aware of having continued access to a former employer’s systems or data*. 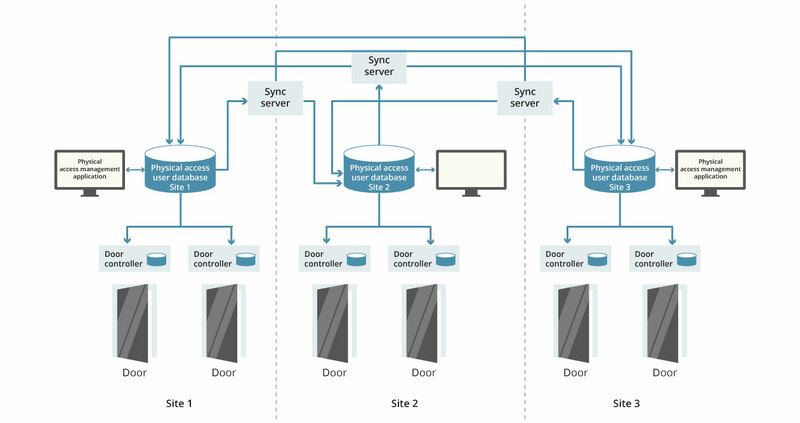 More advanced systems try to address the gap between physical and logical access control systems through a form of pseudo-integration, where separate databases for the two systems are automatically, but only periodically, synchronised. While this avoids risks from failures of business process to ensure that users’ permissions are kept up-to-date in both systems, it adds still further complexity in the synchronisation of the logical access directory with one or more physical access control databases and the management of all the databases holding this duplicated data. The far simpler solution to managing a scalable physical access control system is to leverage the power and flexibility of IT system access controls, which have been developed by leading global technology companies in accordance with established security best practices, and already extend to all users in an organisation across any number of sites. In addition there are significant security benefits to adopting a converged approach to managing physical and logical access, including support for compliance with many data protection standards and regulations. 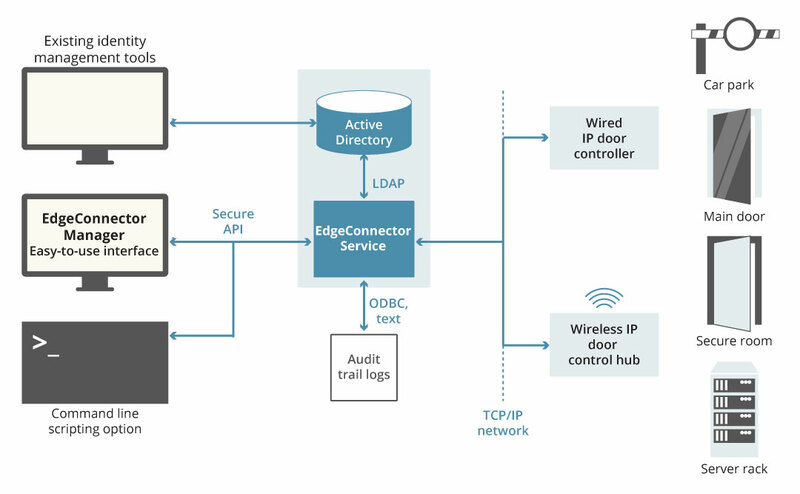 EdgeConnector provides the streamlined solution – converged physical and logical access control using Active Directory as a common database. 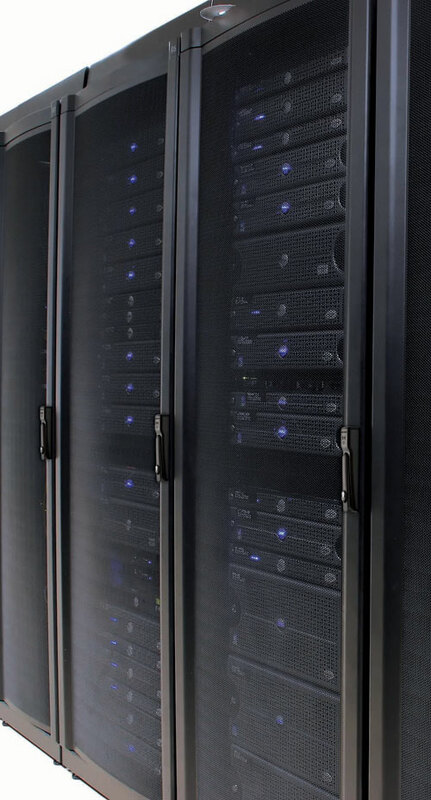 From Active Directory, or a linked identity management application, role-based rights can be extended to include door and server cabinet access. 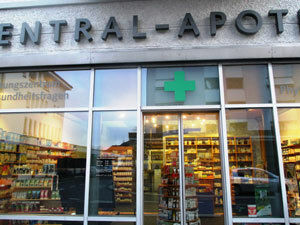 Additionally, logical access rights for users can be adjusted in real-time based on knowledge of their location from door interactions, so for example credit card payment processing applications can be made in-accessible unless users are within secure areas compliant with PCI DSS requirements. Because EdgeConnector utilizes the existing LAN/WAN and Active Directory to manage user permissions for physical access, any door, no matter where it is located, can be controlled through the IP network in just that same way as logical access is controlled for a user logging-in at any workstation on the network. Similarly, the network resilience, Active Directory replication and back-up protection provisions already in-place automatically support the physical access control infrastructure, too. 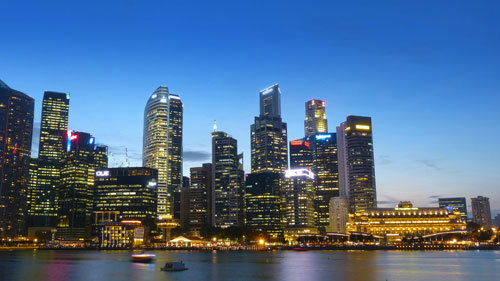 Organisations that provide services locally through a number of sites, dispersed regionally, nationally or globally, can have all their access controlled doors connected to their WAN. The local IP-based door controllers receive a user’s card credentials from the card-reader at the door, and over the WAN ask the EdgeConnector service to validate the access request for those credentials. 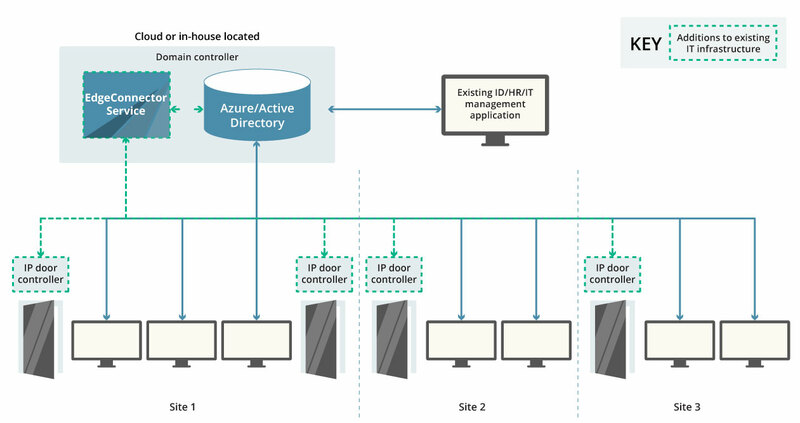 The EdgeConnector service typically runs alongside the central Active Directory database, which may be in-house or cloud hosted, and handles all access control requests from all the door controllers on the entire network. If the user’s permissions allow, the IP door controller will be instructed to release the door to allow them access. This solution model provides access to many thousands of users internationally. Often business expansion through acquisition leads to the evolution of an IT network consisting of multiple domains within a ‘domain forest’. 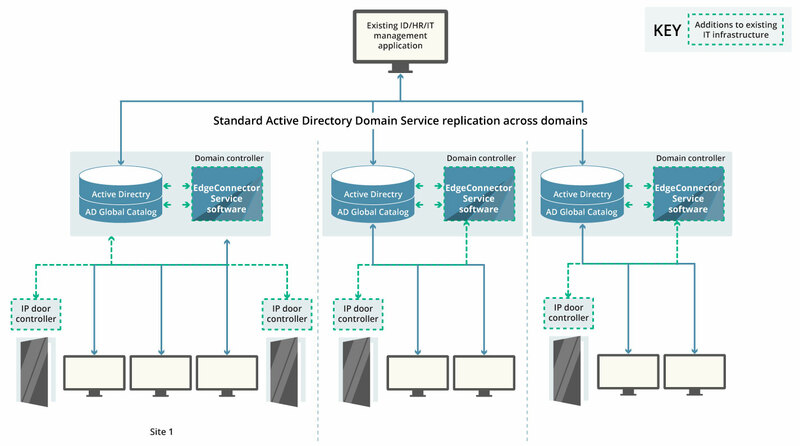 Active Directory manages users across these domains through its ability to automatically create a read-only Global Catalog of users. The Global Catalog is replicated to all the domains within an established trust relationship, allowing a user from any domain to have their credentials validated when requesting access from within any other domain. This also makes it possible for a user turning up at any site to have their RFID access card, or other security credentials, verified to allow entry where permitted by their role-based security profile. EdgeConnector can be deployed as local instances that are aligned with the domain controllers at each site. Each instance of EdgeConnector is easily configured to make use of the local copy of the Global Catalog when validating access requests, while recording individual user actions on the user’s ‘home’ domain instance of Active Directory for compliance and audit trail reporting.